Exotic proteins have become a hot topic in today’s pet food industry. In fact, many pet food providers are beginning to offer new meats, treats and chews while encouraging dog owners to hop on the exotic bandwagon. But why the change? Why are exotic proteins so good for your pup? Pet owners commonly cite variety in diet as the reason for purchasing exotic proteins for their pup. Recently, Pet Business published an article outlining the different benefits that come with adding new items to your dog’s menu. One benefit of exotics, for example, is the ability to enhance a dog’s well-being while also offering a great taste experience. While the familiarity of standard protein food may be appealing, your pup can grow accustomed to its nutrients. To ensure your pup doesn’t develop immunity or an allergic reaction, feed your pup less of the same protein so they can get more out of a variety of proteins. Recent studies suggest your furry companion may actually crave exotic proteins like pheasant, alligator and wild boar. Exotic treats can satisfy your dog’s cravings for a new food experience, and they can supplement any diet by providing fresh, strong proteins. If you’re looking to expand your dog’s diet, start by introducing exotic protein treats to gauge your dog’s interest and tolerance. 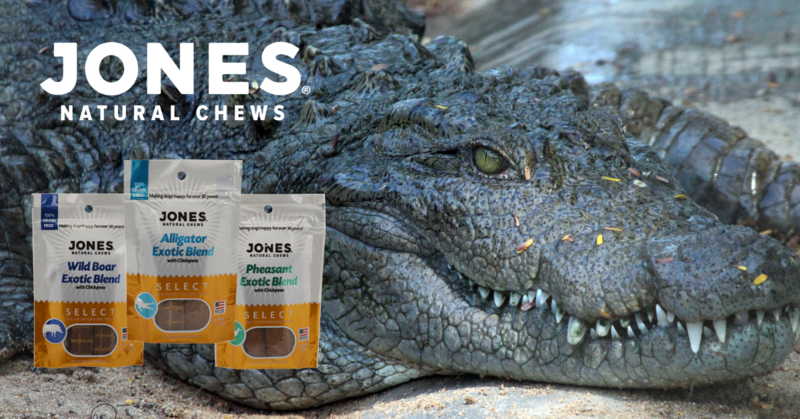 Our Jones Select line of limited ingredient treats includes exotic protein options, including alligator, pheasant and wild boar. We also offer alternatives like duck, lamb, rabbit, salmon, turkey, venison and a wide variety of proteins. Don’t be afraid to explore some new proteins for your dog, but make sure your exotic choices are always made and sourced in the USA. It’s important to know what your dog is eating and where it came from, so treat your pup to proteins that come from reliable domestic sources. As with all Jones Natural Chews products, our Jones Select products are made using natural ingredients sourced and processed exclusively in the United States with no artificial flavors, colors or preservatives added. Our high-protein exotic blends give dogs a great tasting treat and a unique chewing experience.